Here is a position that I created when I was doing some research into hanezeki. I have a few more details of my work on hanezeki. The position here was presaged in a general overview paper on seki. I looked for a way to use the seki-like relationship between the black, and white, groups in the top half of the board. The result is an obviously artificial problem! There is an interactive version, with many variations, but limited comments. I suggest that you read the comments here below first! Fig 1: Black to play – best result? – komi = 1/2 point. You can choose your favourite set of rules. A big win is preferable to a small win. A win is preferable to no result. A no result is preferable to a loss. A small loss is preferable to a big loss. Fig 2: An annotated version of Fig 1. There are four main groups – A, B, C, and D – see Fig 2. 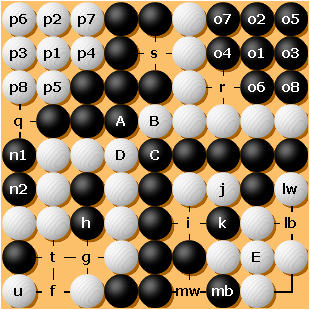 A and B are very similar to each other, except that White can attack Black's A group by capturing at q. After White captures 8 stones by playing at r. Black can get a ko with the sequence black o1 to white o8. If the liberty at s is filled then this ko becomes a simple 10,000-year ko. Similarly, if Black captures at q, then a ko can arise after white p1 to black p8. However, if White has played q, followed by the re-capture at black n1, there is potential for a double ko life for Black – let's say that White plays at p1, Black at p2, White at p8, Black at q, or maybe p3 ... The result would have black stones at q, p4, and p5; white stones at p1, p6, p7, and p8, and Black to play. In the lower right of the board there is a seki with double ko (at lb/lw, and mw/mb) which favours White. Black has a (small) ko threat at i (White responds at j). There is a bigger, but loss-making, threat for White at i (Black responds by re-capturing at k, thus breaking the seki between the black group C, and the white group E). After the natural sequence – black f (captures), white g (captures 2 stones), black h – there is a seki (as long as White does not get an external liberty at n2!). Now, Black at t is a big (but loss-making) ko threat which White can answer by capturing the three black stones with u. Let me have your answers! I am grateful to 안영길 [安永吉] [An YoungKil] (6p) [ Korean Baduk Association profile ] for discussing an earlier (2006) version, and for creating several ko-threats in the bottom right. This gave me encouragement to look further, and I now use the double ko, as well as other ko threats in both the bottom left, and the bottom right! I am also grateful to 이강욱 (李康旭) [LEE Kang-Wook] (2p), for further analysis, and encouragement in 2007. Recently, a preliminary analysis by An YoungKil, together with his friends -- 안조영 ( 安祚永, Jo- Young AN 9P), 이현욱 ( 李賢旭, Hyun-Uk LEE 6P), and 최문용 ( 崔文墉, Moon-Yong CHOI 5P) -- confirmed that, with Japanese and Korean Rules, the best result is a draw (no result) due to multiple kos. Needless to say, all errors/weaknesses that remain are my responsibility.